Cyprus property leaders in assisting buyers and sellers with all their real estate needs in the Paphos district. Tsada Villa, Paphos – An impressive 4 bedroom property located near the village of Tsada. Only a 5 to 10 minute drive from the International School and Paphos Town. Also nearby is also the popular Tsada golf resort. The ground floor features a spacious open plan living room with lounge, dining area and super modern kitchen. There is an open fireplace in the lounge – ideal for those chilly winter nights, and patio windows provide easy access to a covered veranda and the swimming pool terrace. The kitchen is well equipped and has a central island/breakfast bar with integrated dishwasher, electric hob and overhead stainless steel cooker hood. Also included in the sale is a fridge/freezer, built-in oven and second combination oven. The washing machine is situated in the utility area to the side. A hallway leads from the living room to a double bedroom (with fitted wardrobes) currently being used as a study, a shower room, and the impressive staircase with marble and wood finish. Here there is a wall of windows making this a light and airy space. On the first floor are three double size bedrooms, all with fitted wardrobes. The master has a large en-suite shower room, and a covered private balcony with stunning sea and mountain views. A family size bathroom is accessed directly from the landing. Most noteworthy is another added bonus for this home is the huge roof terrace with pergola in addition to the sea and mountain views that are also equally breathtaking. A wonderful place for the home owner to relax and unwind! This property with great views is being sold fully furnished and title deeds are available. 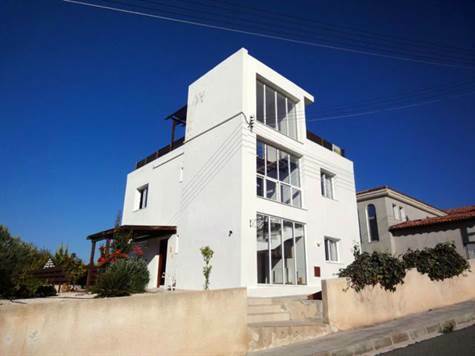 Find our newest Paphos, Cyprus property for sale, updates, price changes and articles. Bookmark this page and visit often so you don't miss Cyprus101's Exclusive Homes only listed here. All homes come with title deeds and don't last long! Copyright © 2019 Paphos, Cyprus Property Sales Real Estate Blog. All Rights Reserved.